We always knew we wanted children. We talked about it prior to getting married, and knew that we’d both want to try to carry children. For us it was really important to try to have the children be (at least partially) related to each other, and in order to do that, we chose to try to have children via a single sperm donor. Our desire to each experience pregnancy and childbirth, and our goal of having the children be related made the decision to have biological children simple for us. With Elisabeth’s pregnancy, there wasn’t much of a journey. We went to a reproductive endocrinologist, and 8 weeks later after just once cycle of trying, she was pregnant. We told family members and friends about 10 weeks into her pregnancy. My journey has been a bit more complicated and at first we were keeping everything quiet, but after running into difficulty we started to be more open to friends and family in order to have a larger circle of support. We also wanted to try to expose them to the reality of infertility struggles that many couples experience but don’t speak openly about. What are some of the challenges you’ve faced raising a child as a lesbian couple? How have you overcome those challenges and what advice would you give new parents in a similar situation? One of the challenges we’ve faced as we both work in professions where being completely out is not necessarily accepted, it has been a learning experience in terms of boundaries. As I am a social worker, and my wife is a teacher, the populations, and sometimes colleagues, we work with may know we have a daughter but do not necessarily know much us about our respective personal lives and it is a tricky balance. We feel like new challenges may arise as our children enter school but we are hoping that we will raise our children with the security to feel good about their family, despite questions or comments from others, and supported by us no matter what. Our biggest setback (in our quest for baby #2) was discovering the uterine polyps (which act as a natural IUD) and needing surgery to remove them. I had many feelings of anger and frustration and felt like we had wasted time, money, tears, and sperm in the three cycles we attempted prior to discovering this problem. It was a pretty difficult time for me emotionally. The funniest thing from the birth of our first daughter- On more than one occasion, many in fact, both family members and friends would make comments like- “Well Amy has big feet.” Or “Does Amy’s side have curly hair?” It’s like even though everyone knows that biologically she’s not mine, at a certain point biology just doesn’t even matter anymore, love takes over. I don’t think that I thought seriously about giving up, but the idea crossed my mind a few times. I’m not a very patient person, and after the first three attempts I felt emotionally drained and not very hopeful. This was compounded by the fact that as a Type 1 Diabetic I had already anticipated a very medicalized, closely monitored pregnancy. I had not necessarily prepared myself for the process of getting pregnant to have so many twists and turns. I really did not ever expect to eventually be undergoing IVF in order to get pregnant and it has been a challenge. Fortunately, having my wife to remind me that if this was a goal that was still important to me and our family we would keep trying until we were successful, kept me focused on what we wanted as things got more complicated. I think answering this question is pretty much impossible. Your life just changes so completely. Sofia has honestly been a super easy, fun, amazing baby. Of course she has gotten to be more of a handful as a toddler but usually in a, “Wow I can’t believe what a little person she is” kind of way. But on the other hand, when you know it’s something you’ve wanted and worked towards it doesn’t feel like really a change but a moving forward. We always imagined and thought about growing our family, so your life just grows along with it. Getting up after 7:30 on a Saturday, ever, would be nice though. We had saved some money from our wedding, approximately $10,000 for family creation/baby making which also served as an emergency fund. We both have great health insurance coverage which has helped us tremendously. We spent $3,500 on sperm (8 vials) in November of 2009 (which gave us free storage for 2 years). After that we did make one storage payment of about $50. We’ve spent somewhere between $600-700 on copays for our RE (both pregnancies). Sofia’s adoption cost us approximately $2,000. My IVF copayment to get started was $2,600 and we probably spent close to $800 on medications. All of that combined, plus hospital expenses for the two surgeries I had to get my body ready to get pregnant, brings us pretty darn close to $10,000 and probably equals at least that much in reality given whatever I’m forgetting. Will you prepare your children to answer questions about their donor(s)? I think that we intend to be very open about our children’s lack of a “daddy”. We will probably refer to him as their donor, and we decided to select an ID Options donor (willing to be known to the child when the child turns 18) so that if they choose to contact their donor when they are of age, they will have that option. I almost want to try to write a children’s book to make it easier for them. For sperm we used Cryogenic Laboratories, they were one of about 6 sperm banks recommended by our RE. We honestly picked them because it was cheaper and we were able to find a donor fitting what we wanted. We chose to use Long Island IVF, who also happened to just merge with a fertility clinic in Brooklyn, because they seemed like a large and successful practice. We fell in love when them on our first visit. We were just happy to have a practice that had gone through the process a million times and was a well-oiled machine. That’s not to say that it is impersonal, we have formed great relationships with nurses and our doctor. For Sofia’s adoption, we used a local agency called Adoption Options. We had positive experiences with each of these providers, and would have sought other services if we felt uncomfortable or unsatisfied in any way. As a side-note, when we first started thinking about really starting a family we went to Planning Biological Parenthood for Women meetings at NYC’s Gay Center. They have all types of parenting and potential parenting meetings. It was really nice to have a chance to meet with other people who had similar questions and experiences. It’s complicated. If at all possible find someone to talk to. Sometimes the to-do lists, and questions, and what-ifs can become seriously overwhelming. It’s really very likely that things may not go the way you expect, or even when they do, you may not feel the way you thought you would. It’s all worth it though. 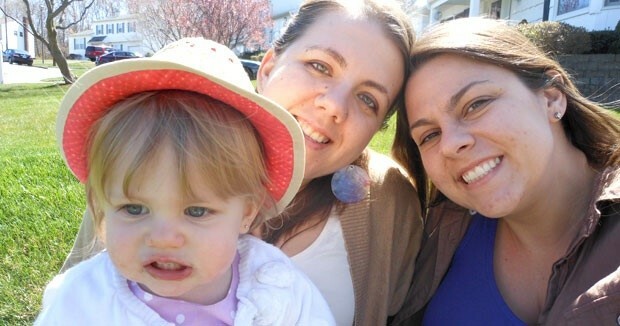 Amy writes about parenting, pregnancy and all the obstacles she and her partner have conquered along the way at her blog, Lesbian Obstacle Course. She and Elisabeth just found out they’ll be expecting another baby girl in 2013. ← HOW DO I HANDLE SECOND PARENT ADOPTION WITH A KNOWN DONOR?